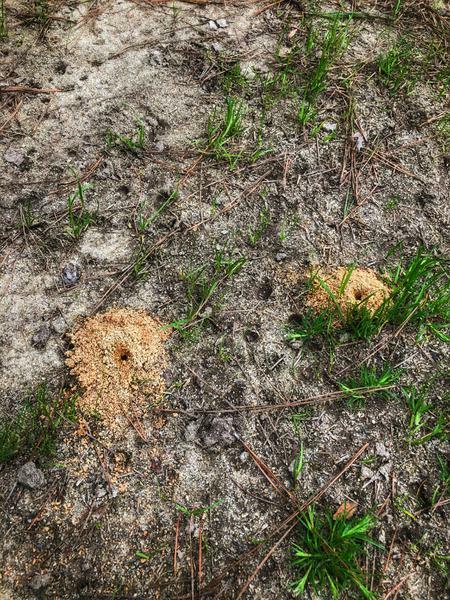 Ground-nesting bees encompass mostly solitary species that create burrows in the ground or tunnel through wood and can range in size from ½ to ¾ inches in length. They can also come in a variety of colors such as blue, green, copper or metallic reddish-brown, depending on species. Leafcutter bees (Megachilidae spp.) are large, solitary bees that build nests in various environments. Mining bees (Andrenidae spp.) are also solitary and are slightly smaller than leafcutter bees, black with reddish hair covering the thorax and sometimes abdomen (Figure 1). Membrane bees (Colletidae spp.) are much smaller and very slender but can resemble some of the more unique mining bee species. Melittidae spp. are small, black bees that also can often be confused with smaller mining bee species. 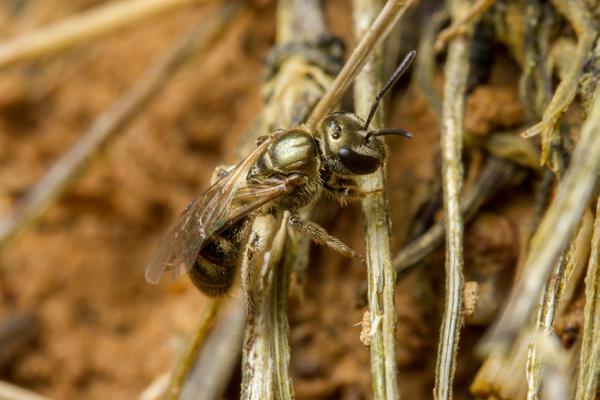 The only ground-nesting bees that can be social, depending on the species and environment, are sweat bees (Halictidae spp.). Halictids are usually tiny, black bees that may or may not have a similar coloration to honey bees (Figure 2). Ground-nesting bees generally prefer warm, dry areas with sun exposure and well-drained soils containing little organic matter. They are more likely to build nests in areas with bare ground or sparse vegetation. Membrane bees can nest aboveground in hollowed-out stems of vegetation, rather than burrowing into the ground itself. Leafcutter bees have the most diverse nesting habits, including nesting in burrows underground, hollowed-out plant stems, wood, and rock crevices. Adult bees generally become active in mid-late spring when females excavate nesting burrows that generally reach six or more inches in depth. During the day, females collect pollen and nectar to carry back to the nest and form a 1/8 to ¼ in diameter “ball” that is placed within a small cell created in the side of the burrow. Females lay a single egg on the pollen ball and when it hatches, the larva feeds on the pollen and continues to develop throughout the year. The new generation will emerge the following year in the spring. When bees are numerous, many holes may be in close proximity, giving the appearance the bees are a social species. They can also be misidentified as nuisance ant colonies due to the numerous mounds created by excavated soil at the turf surface (Figure 3). Damage to lawns and turf is usually minimal and control is rarely necessary unless the bees are numerous and perceived as a danger or annoyance. 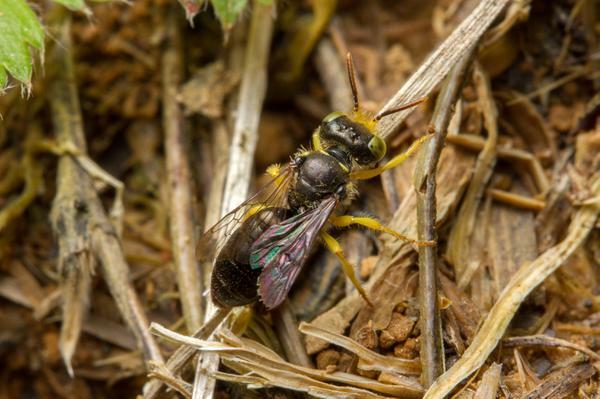 Solitary bees are not “programmed” to sting people and there is no mass attack signal as might be found with social Hymenoptera such as honey bees or yellowjackets. To discourage adult nesting, prep the turf environment to make it less hospitable for females: irrigate the turf heavily, fertilize with organic matter, and use ground covers or heavy mulches in areas of bare soil. In areas where nests are present, tilling of the soil may help partially destroy tunnels but establishment of dense turf is the best discouragement to further nesting. Chemical treatment is almost never necessary. If it is desired in areas with heavy infestations, recommendations for insecticides approved for control of these insects in home lawns can be found under Bees and Wasps in INSECT CONTROL IN HOME LAWNS in the North Carolina Agricultural Chemicals Manual. Recommendations for insecticides approved for use on sod farms, golf courses or other commercial sites can be found in COMMERCIAL TURF INSECT CONTROL in the North Carolina Agricultural Chemicals Manual. For additional information on insect control and pesticide use, contact your county Cooperative Extension Center.